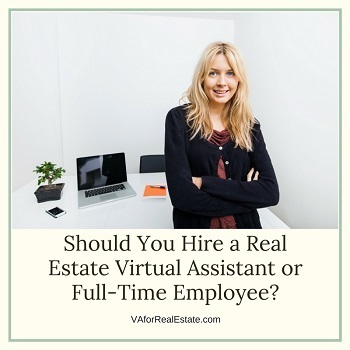 Should You Hire a Real Estate Virtual Assistant or Full-Time Employee? You are here: Home » Real Estate Support Blog » Should You Hire a Real Estate Virtual Assistant or Full-Time Employee? This is a question likely asked by many Realtors® during their career. You want to make the best decision for your business. 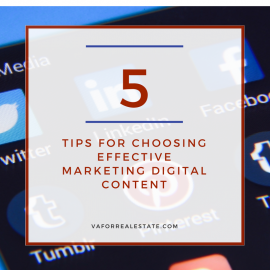 Should you hire a Real Estate Virtual Assistant or a full-time employee? A Real Estate Virtual Assistant can actually save you a lot of your hard-earned dollars. A Virtual Assistant will cost you more per hour but you are not paying them for 40 hours a week, 52 weeks a year. According to your needs, your Virtual Assistant will work on your account for a predetermined number of hours each month. No overtime going out of your pocket. An employee will only have access to your office during normal business hours. With a Virtual Assistant, your projects will be done in a timely manner whether it’s at 9:00 am or midnight. You are free to do what you do best…sell real estate. With an employee, you have taxes, insurance and vacation and sick days. A Virtual Assistant is an independent contractor who pays her own taxes and insurance. She also has everything she needs to complete your projects; computers, office equipment, supplies, etc. As an employer, it would be your responsibility to provide these necessities to your employee. No time-consuming training needed! A Real Estate Virtual Assistant is trained to complete the projects you need. She continues to sharpen her skills through ongoing education. Almost every program needed to complete a project is done online. Whether you’re hiring an employee or an independent contractor, the interview process is important. 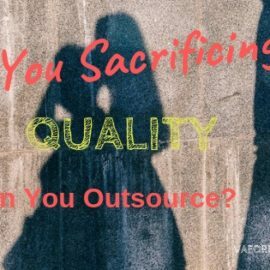 Be sure they have the skills and experience they need to help you in your business. Check their references. A Real Estate Virtual Assistant is an important asset to your business. Weigh your options and decide whether an employee or a contractor works best for you. If you have any questions about hiring a Virtual Assistant, please feel free to contact me. I’m happy to help.